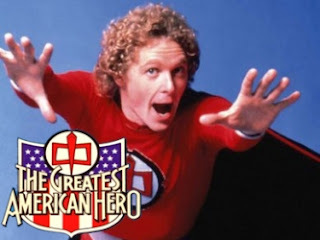 William Katt was awesome as the Greatest American Hero. At nine years old, I loved this silly weekly TV show starring William Katt as The Greatest American Hero. My little brother and I would anxiously wait for Wednesday nights to catch William Katt and Robert Culp in ABC's brilliant 60-minute comedy drama. Researching, I'm surprised to learn it actually only lasted three seasons and 44 episodes. I guess when you're young three seasons feels like an eternity. Part of me wonders if it was the "Believe It or Not" theme song I liked best about The Greatest American Hero, or maybe Bill Katt's wild blond curls. I also found Robert Culp to be quite handsome, even though he was old enough to be my grandpa back in 1981. The show featured William Katt as Ralph, a special education teacher turned superhero. I loved how Ralph becomes a superhero with superhuman powers thanks to a run in with some aliens who gift him a spiffy red superhero costume. Does anyone else remember this early 1980s TV show, The Greatest American Hero? I do remember this show though I could not have told you what it was even about. I think it was all about the theme song for me...and the curly hair. Believe it or not, I'm walking on air...I never thought I could feel so freeeeeeee!!!! LOVED that show...loved that theme song. Best TV theme song EVER!!!! It still holds up and I still remember it to this day! "Believe it or not I'm walking on air. I never thought I could feel so free-eee-eee. Flying away on a wing and a prayer, who could it be? Believe it or not, it's just me!" My sister and I would watch this show together! I remember us sticking our feet into the back of the sofa cushions, squishing them between the frame of the couch and the seat. Then we would hang our torsos 1/2 on the couch seats 1/2 over the edge. When we lifted our arms up in front of us, like super man, WE WERE FLYING! It was so much fun! We would do this every time this show came on. P.S. I have tried that stunt as an adult and it just doesn't work, you have to be small to do it, I just about knocked the couch over on myself! LOL! I loved that show! Only now, unfortunately, that theme song is in my head. Yep, I was a fan. Oddly, this is one of the TV theme songs that bits of randomly pop in my head. You can see this on the Syfy. That's how I learned about it just a few months ago. The opening song is incredible. I discovered Greatest American Hero thanks to VH1's I Love the 80s, lol. So grateful because it truly was a special show. I wrote a brief entry when SyFy was doing a Greatest American Hero marathon this past summer. I hope they do it again next year, so new generations can see it.